Bowling is a fun game that can be enjoyed solo, with friends and family, and even competitively as part of a bowling team or league. It’s a game that can be played in all seasons by young and old, and is a great pastime for beating the searing summertime heat or the bitter cold of winter. In the following article we will explain some of the things you need to know before going bowling, and provide some great beginner tips to get you started on the right foot. Since the first indoor bowling alley opened in 1840 at Knickerbockers, New York City, the game of bowling has really changed very little. Although some of the equipment has been upgraded and even though new technologies have emerged, the standard pieces of equipment required to participate in bowling have really changed very little, starting with the bowling ball and bowling shoes. Along with bowling shoes, which we will cover in the next section, the bowling ball is the most important piece of equipment in the game of bowling. Bowling with the correct ball can drastically improve your score and overall consistency—and bowling with a ball that is not suited for you can have the exact opposite effect. As a beginner, you basically have two choices when it comes to bowling balls: using a house ball or buying your own bowling ball. House balls are those that are provided by the bowling alley for those who do not own their own ball. House balls come in various weights with different finger hole sizes to accommodate a wide range of bowlers, young and old. Bowling balls are available in many different weights, from approximately 9 pounds up to a maximum of 16 pounds. Most professional bowlers use heavy balls (usually 16-pounds), but when you are first starting out you should really base your bowling ball weight on your own strength level and how easy it is to manage the ball. House balls tend to feel heavier than professionally-made balls, largely because the finger holes were not drilled to your exact specifications. When starting out, you should try out a variety of different ball weights until you find one that meets your needs and preferences. If you plan to purchase your own bowling ball, a good rule of thumb is to buy one that is about one to two pound heavier than the house ball you normally use. That’s because a heavier ball, drilled specifically to your hand, will seem to weigh about the same as a house ball, only one to two pounds lighter. If you choose to purchase your own bowling ball, you will need to determine your ideal cover stock before you make a final purchasing decision. The cover stock is the material on the outer surface of the ball. It is very crucial in determining how the ball will react to different lane conditions. There are three main types of cover stocks: polyester (also referred to as plastic), urethane and reactive resin. The best way to choose the perfect cover stock is to talk with your local bowling professional at the pro shop and have him or her evaluate your game. Once you have chosen the perfect weight, cover stock and ultimately the best ball for your game, you will definitely want to have that ball professionally drilled to fit your fingers. Balls that are professionally drilled are much easier to control on the lanes and add a greater degree of consistency. Don’t worry if initially the finger holes seem too tight—they are not. You are probably accustomed to bowling with a house ball whose finger holes were actually too loose for your fingers. Bowling shoes are a must for any bowler at any bowling alley. Like with the bowling ball, you essentially have two choices when it comes to bowling shoes: buy your own or rent a pair from the bowling alley at which you plan to bowl. If you plan to bowl a lot, we recommend you invest in a good pair of quality bowling shoes—shoes that fit your feet perfectly. Not only will this save time every time you bowl, it will also save lots of money over the long term. Additionally, if you do not like the idea of sharing shoes with the entire city, your own bowling shoes can solve that problem. There are two reasons why bowling shoes are required at ever lane in which you will ever bowl: safety and performance. The lanes and approach areas at most bowling alleys are flat and fairly slick. Bowling shoes are specially designed to provide friction and traction on these types of surfaces, whereas other athletic-style shoes are not. Failing to wear bowling shoes, then, can cause any number of accidents and injuries causes by slips and falls. As for performance, bowling shoes are especially designed to slide when in the approach area, adding to the performance of the shoe. Some even have special soles that are designed for braking—an important feature when bowling competitively so as to not slide over the foul line. While the bowling ball and bowling shoes are the only “required” pieces of bowling equipment, you may notice that more experienced bowlers are equipped with extra gear. Here are just a few more pieces of equipment you may want to consider as your game improves. A wrist support, also known as a wrist guard, will prevent the back of your bowling hand from twisting or tilting prior to the delivery of the ball. These pieces of equipment can add consistency to your game and improve your overall scoring. The fingers that go into the holes of the bowling ball can cause friction that can sometimes lead to blisters or scars on those fingers. To prevent this, some bowlers wear finger tapes on the affected fingers, which can also help with your grip prior to delivery. Using talcum powder or baby powder can reduce the moisture on your hands and prevent the fingers from slipping out of the ball. Most experienced bowlers have a towel nearby. They use this towel to wipe away any moisture or excess oil from their bowling ball prior to each shot. This can make a big difference in your control, especially over the course of ten frames. Bowling is a fairly simple game. Whether playing against an opponent or playing alone, the object of bowling is to achieve the highest score possible over the course of ten frames. How do you do that? Try to knock down as many pins as you can. This may seem like a fairly simplistic answer, so let’s go into a little more detail. In bowling there are ten frames. In each frame, a bowler gets to roll the ball twice to knock down as many pins as he or she can. The only time a bowler will roll less than twice (once) in any given frame is if they knock down all of the pins in the first shot—this is called a strike, the best shot in bowling with the highest amount of points. If a bowler fails to knock down all of the pins with their first shot, they will roll a second ball to try and knock down all of the pins still remaining. If they are successful, this is called a spare—the second best shot in bowling. The goal of bowling is to make as many strikes and spares as you can over the course of ten frames. Strikes and spares lead to a type of exponential scoring that increases your overall score, but because most bowling alleys now keep score for you electronically, we will not go into the complicated scoring formulas for the game. The perfect game in bowling—the ultimate quest of professionals and amateurs alike—is a 300 point game. This score can only be achieved by making 12 strikes in a row (one strike in each of the first nine frames and 3 strikes in the 10th frame), and is thus very, very rare. Do not cross over the foul line. On every bowling lane, there is a foul line. This line marks the end of the approach area and the beginning of the lane itself. Stepping over this line can cause you to foul and your shot will not be counted. Wait for the pins to be set. No bowler is allowed to shoot at the rack of pins until all the balls have been reset, and the resetting bar moves up and out of the way. Stay in order. When bowling against an opponent, you are required to bowl in order. In other words, after one bowler completes a frame, the other bowler has his or her turn in that same frame before bowler A can shoot again. Wait for nearby bowlers to clear the lanes. A bowler should never walk up to the approach area or, even worse, attempt to bowl, until the bowlers in the adjacent lanes have taken their shot and cleared their respective approach areas. Doing so can negatively impact the concentration of that bowler and is, quite frankly, rude. This is by far the most important unwritten rule to follow. Stay clear of the approach area until you are ready to bowl. The approach area—the area directly in front of the lane on which you are bowling—should be kept clear until you are ready to bowl. Also, after you take your shot, remove yourself from the approach area as quickly as possible. Keep in mind that other players are trying to bowl as well and just be courteous and cognizant of your station. No talking when others are bowling. Bowling is a game of concentration, so it is very bad form to distract another bowler by talking to them as they are taking their shot. In fact, you should keep the talking and noise to a minimum when bowling so as not to distract nearby bowlers. Be ready. When it is your turn to bowl, you should be present and ready to go. Whether you are bowling in a league or with friends, nothing upsets other players more than having to go looking for a player when it is their turn to shoot. Now that you understand the general bowling strategy and the written and unwritten rules of the game, let’s take just a minute to discuss some basic bowling tips for beginners. Learning the perfect alignment for bowling is not as difficult as you might think. Yes, the balls seem far away, but as a beginner we recommend that you not concentrate on the pins when you bowl, but rather on the arrows that are just a few feet ahead of you on the lane. These arrows represent where the balls are located further down the lane. As a beginner, you will probably be shooting a straight shot, so we recommend you line up between the middle arrow and the arrow just to the left or right of that middle arrow. This area represents the “pocket” in bowling—the spot that produces the most strikes. As a beginner, we recommend you master the straight ball before moving on to the more difficult hook shot, which requires a lot of spin and control. Follow these tips for throwing the perfect straight ball down the lane and hitting your target area consistently. Keep your bowling hand directly underneath the ball and maintain a wrist position that is absolutely straight. Swing your bowling arm out and back. As the ball comes forward, you will want to release the ball as it crosses your ankle, making sure that your hand is straight and your palm is facing upwards. Follow through—as you complete the shot, continue raising your arm until it is roughly at eye height and allow your right foot to slide out and behind your left foot. If you truly want to achieve consistency, you will need to find a starting point on the lane that feels comfortable to you—one in which you have had success in the past. Once you have found/mapped out this successful starting point, go back to it every time you bowl. This will increase both your confidence and consistency. Timing is everything in bowling. Because of this, you will need to get your timing down and repeat those steps time and time again. Each step of your foot should be synched up with a specific part of your arm swing and release. Find the right timing for your game and you will have conquered a good portion of the game. Your aim, starting position, hand position and timing are all components that make up your approach. Once you put all of these components together you are sure to have a clean approach that you can replicate consistently. Be sure to practice this approach as often as possible for best results. According to experts, the ideal speed of a bowling ball is 16 miles per hour. However, the perfect ball speed for you is the speed at which you can consistently knock down the highest number of pins. If you want to increase the speed of the ball, simply hold it a little higher in your stance, and if you want to slow down the ball, hold the ball a little lower than normal. Try to experiment with different speeds until you one that works well for you. In the end, bowling is truly all about having fun. 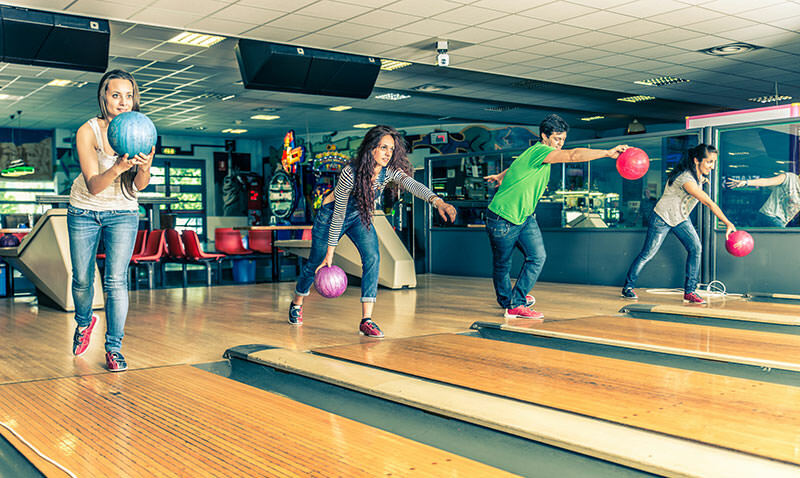 Use your time at the bowling alley as a way to relax and escape the pressures of your day to day life. Sure, you can challenge yourself to reach new heights in terms of your score, but don’t be too hard on yourself if that doesn’t happen overnight. Also, try and refrain from playing with people who take the game “too seriously”—you know the types; the ones who curse and throw a tantrum after every bad shot. People like that will only ruin your fun and tarnish your love of this great game.